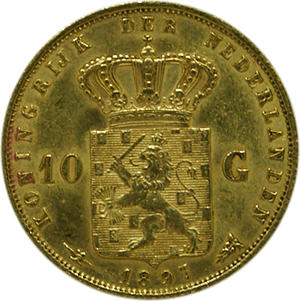 The 10 Dutch Guilder Gold Coin was a part of the Dutch currency from the 17th century, which existed up until its replacement in 2002 with the Euro. The name Guilder is actually translated from the “Middle Dutch” for golden, referring to the high-quality gold that made up the coin’s composition. One of Europe’s most iconic coins, it remains popular with collectors, the most rare of which are considered highly valuable. 10 Guilder Gold Coins were discontinued in 1933, making them relatively scarce compared to other Guilders of the age, some of which were produced up until German occupation in the Second World War. Coins from this period were made from zinc. These were replaced with silver, which were produced in the United Sates in an effort to restart the Dutch economy. All Nazi occupation coins were melted and demonetised in the post war years. There are two main versions of the 10 Guilder Gold Coin, with the King Willem III designs rarer, and therefore more valuable, than the Queen Wilhelmina releases. The coins themselves are 22 carats, which is of the very highest purity for coinage at the time. This means they are made from 91.6% pure gold. Any purer and the coins are liable to mark easily, which is why 24 gold coins are not used as currency apart from collector’s items or modern gold bullion. As with any valuable coin, historic or otherwise, it is important to ensure that you are purchasing it from a respected source. Forgeries of some items are rife and some simply mislabelled in order to make them seem more valuable than they are. GoldInvestments.co.uk are one of the UK’s most experienced vendors, with years of providing quality products and service to our customers. We are also happy to offer advice on all precious metal coinage and items from our office in the heart of London.